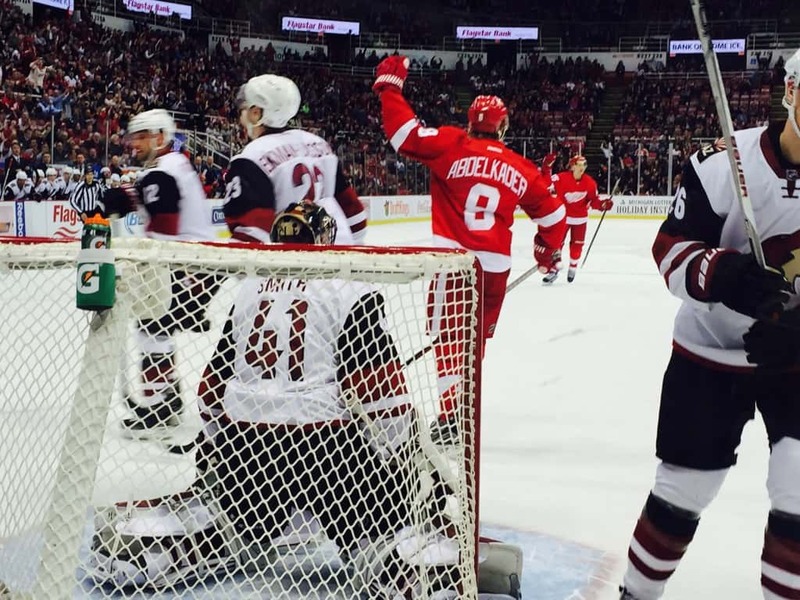 DETROIT, Mich. — The Arizona Coyotes paid a visit to the Detroit Red Wings Thursday for their first meeting of the season and left empty handed. Detroit continued their nine-game point streak and didn’t waste any time taking the lead, defeating the Coyotes 5-1. Detroit’s record now improves to 14-8-4 on the season while Arizona moves to 13-11-1. With Pavel Datsyuk’s recent return, tonight was his 888th career game and Nikolas Kronwall’s 700th career game. The game was highly anticipated, as well, due to the game featuring two of the NHL’s top rookies in Detroit’s Dylan Larkin and Arizona’s Max Domi. The first period started off action packed as the Coyotes’ Klas Dahlbeck scored 1:22 into the game then had the goal recalled after Blashill challenged it for offsides. With the score back at zero, Detroit hustled to get the first official goal of the game. Abdelkader proved why he is a key player and considered a $30 million-dollar-man by making the score 1-0 with the assist going to Dylan Larkin. Shortly after, Tomas Tatar and Datsyuk worked their magic and set up a beautiful goal for Kronwall to push the lead to 2-0 all within the final minute of the period. Detroit added to their lead as Gustav Nyquist found the net on a simple dump in from the neutral zone that took a funny hop and snuck past Arizona goaltender Mike Smith. Brendan Smith made sure to end the period the right way by dropping the mitts with Kyle Chipchura and bringing the crowd to their feet. To start the second period, ASmith was pulled after allowing three goals in the first period. The new goalie, Anders Lindback, received no slack as Detroit fired continuous shots with no mercy. Jordan Martinook eventually put Arizona back in the game with a goal to make the score 3-1. Lindback stood strong for eight shots, but the ninth resulted in a goal by Danny DeKeyser with assists from Jonathan Ericcson and Pavel Datsyuk which increased the score to 4-1. The third period brought more luck to Detroit and left Arizona in the dust. As Lindback attempted to clear the puck behind his own net, Darren Helm caught a piece of it and took advantage of the opportunity, tracking down the puck and firing it into the gaping net to push the score to 5-1 to end the game. The process must be working considering Detroit finished with 40 plus shots on goal for their second straight game and they look to start another winning streak. Their third straight win could come Saturday as Detroit takes on the Nashville Predators at home with puck drop at 7 pm.